Severe acute brain injury (SABI) is responsible for 12 million deaths annually, prolonged disability in survivors, and substantial resource utilization. Little guidance exists regarding indication or optimal timing of tracheostomy after SABI. Our aims were to determine national trends in tracheostomy utilization among mechanically ventilated patients with SABI in the USA, as well as to examine factors associated with tracheostomy utilization following SABI. We conducted a population-based retrospective cohort study using the National Inpatient Sample from 2002 to 2011. 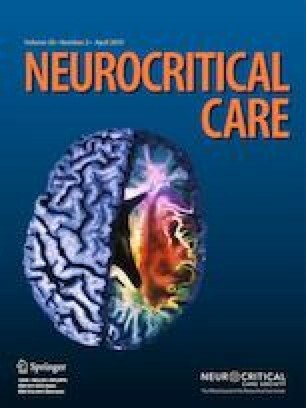 We identified adult patients with SABI, defined as a primary diagnosis of stroke, traumatic brain injury or post-cardiac arrest who received mechanical ventilation for greater than 96 h. We analyzed trends in tracheostomy utilization over time and used multilevel mixed-effects logistic regression to analyze factors associated with tracheostomy utilization. There were 94,082 hospitalizations for SABI during the study period, with 30,455 (32%) resulting in tracheostomy utilization. The proportion of patients with SABI who received a tracheostomy increased during the study period, from 28.0% in 2002 to 32.1% in 2011 (p < 0.001). Variation in tracheostomy utilization was noted based on patient and facility characteristics, including higher odds of tracheostomy in large hospitals (OR 1.34, 95% CI 1.18–1.53, p < 0.001, compared to small hospitals), teaching hospitals (OR 1.15, 95% CI 1.06–1.25, p = 0.001, compared to non-teaching hospitals), and urban hospitals (OR 1.60, 95% CI 1.33–1.92, p < 0.001, compared to rural hospitals). Tracheostomy utilization has increased in the USA among patients with SABI, with wide variation by patient and facility-level factors. The online version of this article ( https://doi.org/10.1007/s12028-019-00697-5) contains supplementary material, which is available to authorized users. All authors have given final approval of the published work. VK contributed to the conception and design of the work, analysis, interpretation, and drafting the manuscript. CLH, MSV, JK, AVL, KR, CJC contributed to the conception and design of the work, interpretation, and drafting the manuscript. NC contributed to the analysis, interpretation, and drafting the manuscript. NIH L30 NS084420 (Krishnamoorthy), K23 NS099421 (Creutzfeldt).